Linda Burton posting from Lincoln, Nebraska – Which frightens you most – spiders or lightning? For me it has always been lightning, like the stuff that welcomed me to Nebraska today in a frenzy of white slashing black over the green prairie to the west. Could I outrun the storm? It was moving west to east; I was traveling south to north; it was a futile contest; I lost. I’ve never seen much lightning before, as I tend to head for cover at the sound of the first thunderclap. Today I had no choice but to look. I had to keep my eyes on the road and sky; there was no place to stop; only open prairie. By sheer force nature made me realize just what amazing tricks it can do. 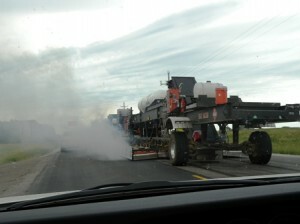 Cloud to ground! Cloud to cloud! I counted more than a hundred streaks before the storm engulfed me with rain and then I couldn’t see a thing. Until I reached my hotel and flipped the blinker to signal left. That’s when I saw the spider and forgot the storm. My priorities changed! It was a substantial-looking brown spider, directly above the steering column and crawling down. I grabbed the first thing I could – a piece of paper with today’s driving directions – and smashed it against the spider. I missed. The spider fell to my feet. I’d heard tales of wrecks caused by insects; although the storm raged around me and traffic whizzed by on either side, my basic instinct was to jump out of the car. But I didn’t. I made it into the hotel parking lot and got the cats and myself inside out of the storm, where I immediately began to read up on spiders. Because after all, that healthy brown arachnid was still in my car. What happened to my lovely day? 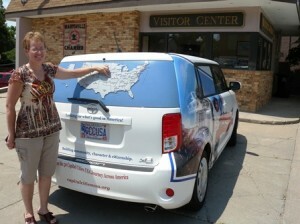 In Topeka this morning I loaded the car before the sun got too high and then wandered through the hotel saying goodbyes to the staff. Out front there was a flurry of picture-taking as Sheryl and Chuck brought me bottles of water (one for me and one for the cats) and studied the map to see where the Journey would take me next; we’ll follow you on your blog, they promised. 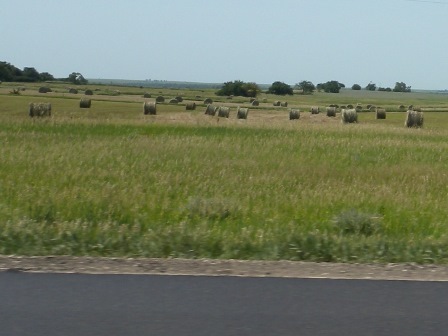 Onto I-70 West and the first section of Interstate opened in the country, still in good shape; through the Flint Hills, where bales of fresh-cut alfalfa already dotted the landscape. Exit 313 north to Manhattan, across the Kansas River at the edge of the city, and the Kansas State campus; on to Marysville and the first stop. Brenda was on duty in the Chamber of Commerce Visitor Center; a walking encyclopedia of facts about Marysville, a historic town with brick-paved streets. It’s nicknamed the City of Black Squirrels (no kidding, one of only two places in the country where the squirrels are black! 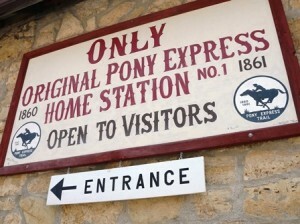 ); it’s the home of the very first Pony Express station on the route from Missouri. 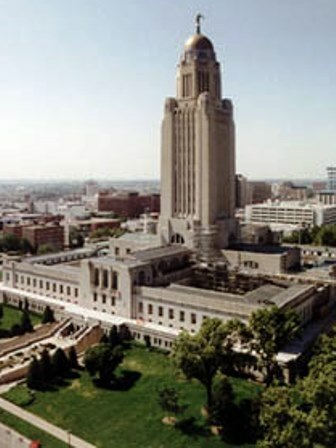 The original building still stands; it’s the only one left in the country. I parked the car in a shady spot and briefly toured the Museum of the Pony Express, the mail delivery business that ended with the advent of trains, the new horses of the prairie. 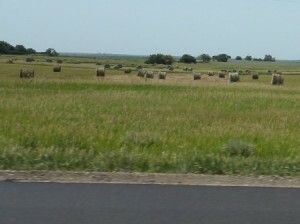 Two stops on Hwy 77 for road construction with long waits for the pilot car; I sat in the midst of sweet-smelling prairie grasses with the windows down. 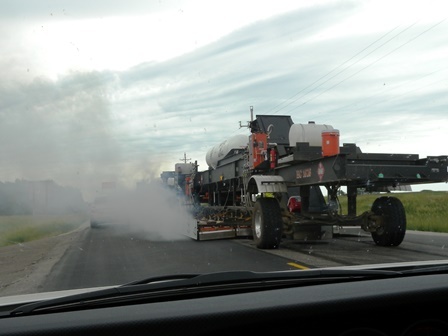 Windows went back up as we were led past the paving machines, where the odor of steaming asphalt was so overpowering it made Jack Cat growl; that throaty warning designed to scare away the enemy. 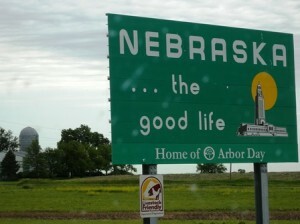 Then Nebraska, and “…the good life”, according to the big green welcome sign, which pictured the high-rise state capitol against the background of a brilliant sun. Behind the sign, a barn, a silo, more growing fields, and gathering clouds. 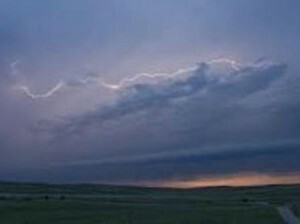 Which brings me back to the beginning of the story — a Nebraska lightning show. 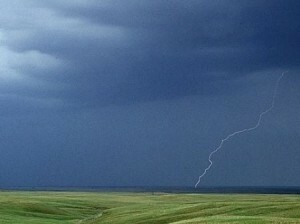 Lightning may be more visible in Nebraska due to the wide-open spaces, but Nebraska doesn’t even rank in the top 10 in lightning fatalities; the leader there is Florida, the Lightning Capital of the US; followed by Michigan, Pennsylvania, North Carolina, New York, Ohio, Texas, Tennessee, Georgia, and Colorado. So far this year, there have been seven deaths caused by lightning; two in Florida (fishing on the lake and walking on the beach); two in Illinois (fishing on the river and standing in the park); and one each in Missouri, Louisiana, and Texas (front yard under trees, in boat on lake, outside restaurant). There’s definitely a pattern here and the National Weather Service reminds us every time a storm approaches: go inside! That’s always been my action of choice. I did my weather research before starting today’s trip; nothing severe had been predicted. One thing to remember about thunderstorms (out of which deadly tornadoes form) is their tendency to build with the day’s heat, so traveling early in the day is best in summer. Three myths and facts from the National Weather Service. Fact: Most cars are safe from lightning, but it is the metal roof and metal sides that protect you, not the rubber tires. When lightning strikes a vehicle, it goes through the metal frame into the ground. Myth: If trapped outside and lightning is about to strike, lie flat on the ground. Fact: Lying flat increases your chance of being affected by potentially deadly ground current. If you are caught outside in a thunderstorm, keep moving toward a safe shelter. Overall, I guess I made the best choice for dealing with today’s unexpected storm. Regarding the spider, there is good news, and bad. I looked up “brown recluse” since the spider in the car was definitely brown. 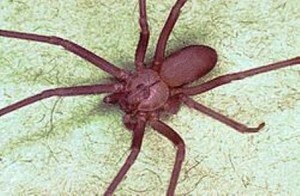 Looking at photos of the brown recluse, I’m almost certain my assumption was correct. 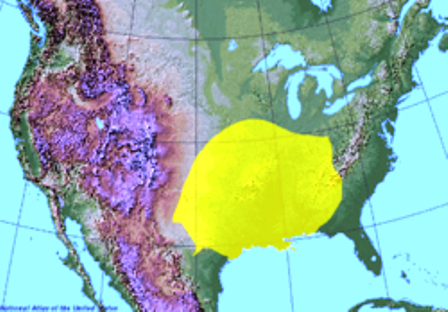 And the native range of the brown recluse lies roughly south of a line from southeastern Nebraska through southern Iowa, Illinois, and Indiana to southwestern Ohio. (In the southern states, it is native from central Texas to western Georgia and north to Kentucky.) From its name you know its preferences; it is reclusive! It doesn’t like to be disturbed; as I looked back over the day I thought it must have climbed into my car while I stopped for the repaving; the noises and smells surely disturbed its peace and quiet. I’m pleased to learn it is rarely aggressive, bites are uncommon and fatalities are rare, usually in young children with weaker immune systems. The bad news is this: adults live up to two years, and females produce several egg sacs from May to July, with about fifty eggs per sac; they hatch in a month. And the brown recluse can go for seasons without food or water. But the worst news is this – in the Midwest the spiders have adapted to extermination attempts, getting hardier and hardier. Yikes! 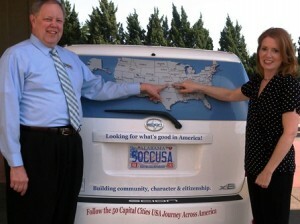 It’s time for help from the Car Talk guys. How will I get that little sucker out of my car before it lays a hundred eggs? I’ve got a new city to explore; I’m in Lincoln, Nebraska, population 258,379; elevation 1,176 feet; my furthest point west in the final loop of the Journey and my 34th stop. There’s much to see and do in this capital city with the only domed high-rise capitol building in the country; a city named for a president. I’ve got to get out there and get busy; I can’t be deterred by an itsy bitsy spider.